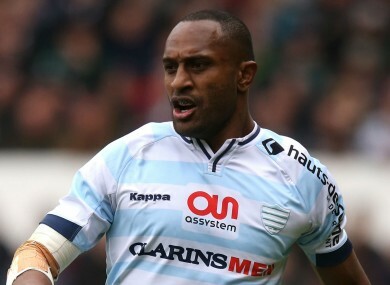 JOE ROKOCOKO’S LATE try made sure of Racing 92′s place in the Top 14 semi-finals after a tense 22-13 victory away to Montpellier. Hosts Montpellier finished third in the table in the regular season, 14 points ahead of Ronan O’Gara’s side side. But it was the visitors who started strongly at Altrad Stadium, Leone Nakarawa selling a dummy to dot down in the 15th minute and Dan Carter converting, Racing team-mate Yannick Nyanga having been denied a try moments earlier for entering touch. A sustained period of Montpellier pressure led to Benoit Paillaugue taking a penalty quickly and scoring for the home team in the 19th minute, Willie du Plessis adding the extras. Montpellier were back on level terms for just four minutes, though, before Teddy Thomas crossed and Carter converted to send Racing back in front. Demetri Catrakilis sent over penalties for Montpellier either side of half-time, but they lost Francois Steyn to the sin bin in the 48th minute for a dangerous tackle on Nyanga. After a nervous second half from both teams, Rokocoko was found in space out on the right and crossed with six minutes to go to afford Racing some breathing room. And although Carter missed the conversion attempt, he dispatched a late penalty to make absolutely sure after Jannie Du Plessis was sent off for throwing punches. Racing will face Clermont, who finished second in the table, in the last four in Marseille next Saturday. Email “Montpellier lose their cool as ROG's Racing book Clermont semi-final”. Feedback on “Montpellier lose their cool as ROG's Racing book Clermont semi-final”.